Sure is pretty outside this time of year, lots of snow, plenty of fish, water in Arkansas… Been tough on the mend with such great conditions this winter occurring! Taking stock lately while lying low here recovering from a shoulder “fix it” surgery, wrapped in a blanket of thankful for the life I’ve been allowed. It’s only been a month since the knife, (which was officially the longest intermission from trout in my adult life, this two weeks in), and I can’t tell you in words how much I miss the water and what a part of my life the river is, and then without… I’ve read three books, cleaned my house twice, and organized every piece of equipment and photo I own, down to the small stuff. All in all, cabin fever has set in, and a report is overdue. Keeping up with those who have been frequenting the river lately, I have a great handle on the movements as of lately managing to fish into the second week of January, and boy are those fish running BIG this year. Being laid up with an arm coming back to life, I can’t engage, but by comparison to other winters where bowing out till the weather rebounds is an option; I would put it to you to get up here and “GET SOME” since the fish are as big as they get this year, this and the numbers are above par. 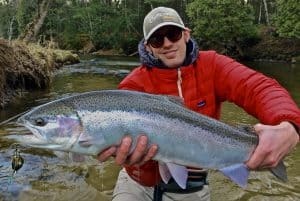 Best fishing I’ve been hearing of has been on swing and egg gear, which is typical; but seemingly everyone is passing on the strip options which is a huge mistake as this time of year yields the best strip game for the steelhead. Muskegon fished great on the strip just days before I got cut, so back we went back for seconds with air temps in the teens where Brad Turner scored a 27.5 brown, (his largest ever in MI), just before his April exodus to Montana. There will be no southern watersheds for me this winter as I heal up through the MI slow season, but we’ll be back after it in 2019 for certain as this is the time of year I head down there for several weeks typically and have for the last 6 years. Next year will be great with the improved shoulder, till then, not booking myself till the 1st of April as of now, but we do have guides to get you out that are very skilled and the fishing is worth it. It’s been a good year for steelhead and the spring runs will start in likely about a month. Brown trout fishing lately has been great, especially leading into this month! Stripping in the winter for steelhead begs a different program versus the warmer waters of October and November; and this year those months weren’t as good as years passed as the fish just came it really fat and happy and didn’t need the calories like they have in Autumns past. By December the stripping game came online nicely with food running low and numbers on the rise, then we were rolling and scoring multiple steelhead on the strip each pass, and mixing it up nicely with the butter on the post spawn bite. Proximity in cooler waters is the offense, not the retreating opportunity afforded in presenting the warmer water. Drunk & Disorderly was designed to maximize action in shortened areas and therein should be considered like a Hot & Tot in the presentation angle; and the amount of wiggle, coupled with float recovery action, can be satisfied in pre determined spots. 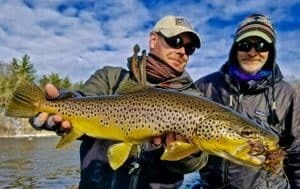 When fishing brown trout up and down most any trout stream, the strike may come from anywhere, in any depth structure; with migratory fish, being more offended by the light in the shallower river, holding lies are somewhat foreseeable with depth as a consideration. If you size up any one bend or hole you can often identify feeding lanes and present accordingly. Warmer water months have you fishing from the bank to the boat with little downstream angle so there is less decision time for a trout or steelhead to take, forcing a sack like stance from the predator. During the winter/cold water months, present the fly just down and away to provoke the fish by way of invasion, as many will be hanging pretty low key, but certainly bored and easily offended. 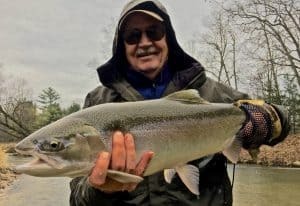 Many pushes of fall and winter fish already in place, a steelhead needs to be aggressive in collecting his winter calories needed not only to get him through the colder months, but also the act of spawning, and then again returning to the big lake. With the downstream you offer a fish, maybe not willing to chase it into the boat, but one that needs to capitalize on whatever available, when it is. Short strips, with up to a few seconds in pause after a good campaign of sharper strips to really draw the kitty. Rarely the steelhead misses in the winter… Best colors just before surgery were the orange/yellow spectrums… Browns were still on the “SHAT”, but dirty pale yellow did well with them too. Do yourself a favor and pick up that Airflo Surf Line as it plays almost anywhere and doesn’t leave you hurrying to keep you line and fly from grabbing the bottom this time of year. Max Short is still the best all around smaller water in varied grains weights and should be considered each river level variance much like a MOW selection; also works well bank busting big tail-waters in big flow, but diversity in your sink tips is much like have different clubs in your golf bag, and each have there use. Call Schultz Outfitters and give them your watershed target, and they can dial you up with just what the doctor ordered… Their staff is WAY ahead of the curve when it comes to matching rods and varied watershed compliment. Eggin/Nymphing is always the most productive way to fish to the bulk of the population as it allows for multiple presentations in the sweet spots, even with multiple patterns. That said, if there are enough people doing it in those sweet spots, it might be safe to say it is the worst way to engage as they are just seeing too much of that. Each weekend it gets really nice in the winter, which are those days over 32 degrees, a good number of people show up to fish without ice in the guides, with many of those people fishing the same mileage and it doesn’t pay considering the counts of fish in those areas; this unless you’re the first presentations in each spot that day, be it swing or bob. Presentation is a huge piece of the pie anytime your begging the dead drift, but so is pattern and when it might arrive in a run per daytime heating, fishing pressure, light angles, and even daily water level bumps with snow melt. Pick your battles more strategically and likely your audience will be less aware and then more likely to warm to your presentation. Smaller stones will be in the menu BIG time for the rest of the winter and spring, with wiggle hex and hares ear playing too. Eggs work as good as any nymph might be able too, and then likely better for steelhead. 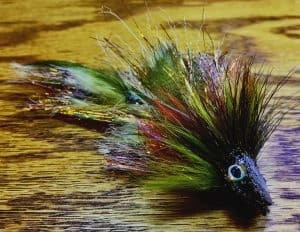 If you favor the browns, eggs work well, scaled way down, but the nymphs own the winter trout! Don’t think for a second that streamers don’t play really well in the winter for trout, they do well thanks to the enhanced post spawn greed needed to push them through the cool months, post nookie sessions. But as the water begins to warm this spring, the chase will be even more enhanced by the warming, wintered trout. 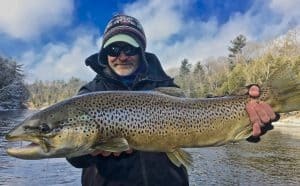 Fishing pressure increasing for steelhead, there are so many great trout runs that nymph well in the winter/early spring that are ignored by the steelhead anglers looking for depth over feeding lanes. When fishing a little 9’5wt in the winter, the surprise of not only how productive trout fishing is, but then again, the occasional steelhead that will make that rod look like a snoopy pole in a matter of seconds, is no bad thing… Nymphing is the best way to wade angle our stream, this or swing fishing, which may be less productive but provides far more to the angler per event. To truly mix up the entire watershed, stripping flies begs the predator from most of the miles fished on any given day from the boat, and allows one to not fish water that has been pounded on by all the stationary anglers. 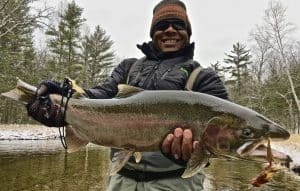 This might likely be the best month of strip streamer fishing for steelhead on these western Michigan watersheds, and few are engaging this awesome venue. When the food is scarce and the population of migratory fish is up, this and gathering higher is the rivers; makes for the right time to add flash and offense to the equation to tip one of the players into protest by means of pummeling. Be it strip or swing, we are begging for the same fish, the one that would not yield or spook, but instead attack with extreme prejudice. Not being an egg, the hit is much more personal and ending for the presented mess of flash. Pure swing falling second to some mending and depth persuasion with slack and slowed present… Providing more taunt time to fish that get a slower step on the pounce or need a little more incentive to move, are best served slower overall in the colder season. Strip begs the same idea, but the varied action in retreat, with slack pauses could almost be fished as slow as a swung fly cast in the winter months. Same fish, with even more need to feed, just a different presentation overall to persuade the movement too, which really is the tip over point in presentation… Simply getting the fish to notice, then too follow. Depth helps, but if the water is clear, I’ve had them come way up to get even the stripped fly retreating faster. 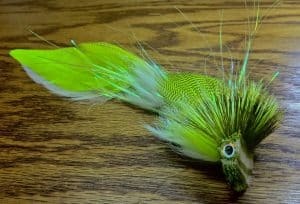 There is an idea that you need to be on, or very close to the bottom to present a swung or stripped fly to steelhead and browns… And I’m not sure I’m buying it. Being just below the half way point of the column has shown me that the fish, especially the keyed up feeders or movers, do notice the pattern in all its flash and trek, from a distance, and would in fact prefer, much like a shark, to come up and under their prey. Bottom dwelling hits turn into follows often, as the fish has to set up the kill differently and often trailing the fly, or the quick sack… But rarely allowing for set up from below. If you then fish a fly in a prescribed area of the column you are now fishing in a zone that begs for a trout to not only take notice, but then set up a perfect killing angle. Casting just up stream with a strip fly will bring the fly through this plain in most cases, and with this angle, force the fish to react instead of inspect with the opportunity not holding. With a swung fly, the idea is the same in depth, but instead of the across river position for trout as just mentioned, you will fish to show not the flank and front of the streamer, so much as the underside and the rear… Backing a streamer into the head of treading steelhead encourages the fish to swipe as the fly is off step and now invading the fishes space forcing a spook or kill response. Personally I’ve never seen too much difference in this color or that, but I do have some confidence colors as do many others, but too much variance with both browns and steelhead, with browns chasing more overall and critiquing versus the less wary steelhead that simply crush as soon as the chase is afoot. Streamer fishing may not produce the best fly fishing numbers next to nymphing, but each fish is worth more from the presentation and strike front than say watching the bobber drop… And bouncing the bottom with level lines, aka Chuck & Duck, doesn’t even count as the fly fishing presentation is lost and it becomes more of a conventional approach than a fly fishing one. 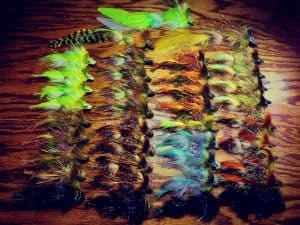 Once you have caught enough on nymphs and eggs, typically one evolves into streamer game in some respect looking for, there again, more sport from each outing… This and tying streamers is so much more fun! Don’t forget, buy definition, fly fishing is the worst way to catch fish; and in being so, adds a level of sport not found in conventional tactics. Don’t see any big fluctuations in the bite window between now and the beginning of March. Steelheads are running larger than normal for sure this run; and the push count of fish is average, or just above, for this time of year. Residing top to bottom in the river right now, pending your approach, all sections play in the favorable water flows of winter. Summer run fish are starting to spawn already, so be aware of where your walking in the river from now on so that spawning gravels are left alone and not smashed and trashed. Try and start fishing some of the secondary, pre spawn runs, for those early fall migratory fish as they will be spawning by the middle of next month, if not sooner, pending the warm ups. Plenty of snow dropped last night, just shy of a foot, but we did have a melt already this January so we do have plenty of snow on the ground for now making for some great backdrops, but not so deep to dampen your efforts. Fishing pressure is always there on the weekends above 27 degrees, but any days with highs reaching the 30’s or above, plan on allot of anglers since cabin fever runs heavy this time of year. Often I prefer fishing the middle to upper twenties just because I end up busting as many fish as I do ice from the guides. Fewer people means fish are more willing and unaware… Gear we have these days will allow for decent fishing into the teens, with the 20’s being balmy and better… If your coming up to fish this time of year, and you do have a couple/few days to fish, consider doing the 3 In 1 with steelhead presentations buy getting one on the strip, the swing, and then the egg/nymph presented with a floating line! Personally I’ve only done it 4 times, but when the bite is right, it can be done. Next year I’m getting one taking a dry fly on camera… That’s my next goal with steelhead… Set them, and then move forward… Don’t get stuck in a rut! 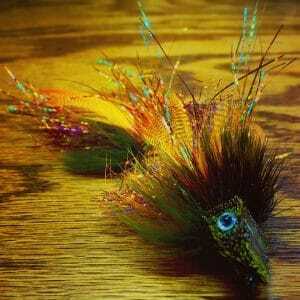 Only 7 Bookings in May/Great Streamer & Drake Fishing… Terribly Overlooked Month!